In the summer of 2012, my wife and I walked the 500-mile El Camino de Santiago in northern Spain, following the footsteps of fellow Christians who’ve made this pilgrimage for over a thousand years. We began in the southwest corner of France, crossed the Pyrenees into Spain, then walked west for 33 days — one day for each year in the life of Christ. Last year 180,000 pilgrims from 140 countries walked the Way of St. James. The camino ends at the Cathedral of St. James, a massive edifice with a history that began in 829 AD, and where legend says the bones of St. James are buried. If you are fortunate, this end signals a new beginning in your life. 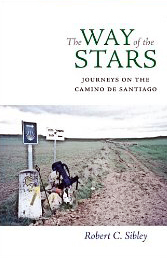 The Canadian journalist Robert Sibley recalls his own camino experiences in this travel memoir. He calls himself a lapsed Catholic and agnostic. He walked the camino to keep a promise to his son, and as a journalist trip sponsored by his employer. Like many pilgrims, he also wanted to escape the ruts and routines of everyday life. But Sibley also admits to deeper and more explicitly spiritual motives, which longings grew stronger mile by mile. And despite secular embarrassment at the way of faith, why not admit it, he confesses; the mystery we seek is God. One night late in the trip, he had an intense dream about his father. He awoke drenched with sweat at 5AM. He opened his hotel windows onto the morning darkness, heard a man playing a flute in the plaza mayor, and started to cry for the first time in decades. At the end of his trip when he went to the pilgrims’ office to get his certificate of completion, like all pilgrims he was asked about the motive for his trip. He replied without hesitation, “Espiritualidad.” Like so many who have walked this way, he discovered that while he journeyed the camino, the camino journeyed through the spiritual geography of his own heart. If you’ve ever wanted to walk the camino de Santiago, consider a friend’s advice to Sibley. “Sometimes you have to act before you know the meaning of your actions. The knowing comes after the doing.” So just go.